All in white, the wood, the metal, the ceramic knobs. A combination that gives the coastal feel that we love. 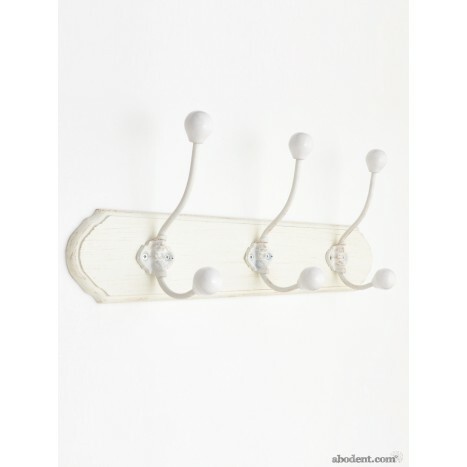 Not overly weathered or worn but with hints of age in the paintwork, this classically styled coat rack offers a fresh approach to a traditional style. Tags: large cream coat rack, big wooden coat racks, painted while wooden coat racks, three hook coat rack, 3 hook on wooden plaque, 6 ceramic coat hooks on wooden base, wood and metal coat racks, weathered coat racks, uk coat racks, vintage coat rack.